Zarathustra is a frontier planet, so during the trial there is much in the way of frontier law, which mostly includes biased judges and bribery. Witnesses don’t even need to swear to tell the truth and nothing but the truth, as they are hooked up to a high tech lie detector test as they are questioned. Like I said, this book is beyond cute. I never for one moment thought it wouldn’t have a happy ending. And it does have quite the happy ending. The Fuzzies want to live with humans, they know humans may be the only people who can help them. Like a lot of stories written at the time, Little Fuzzy is amusingly sexist. I say amusingly, because I know no harm was meant. Men are men, yet all women, from licenced doctors to secretaries are “girls” who are simply waiting for a man to propose marriage to them. Totally sexist, but don’t be too mad, as Piper gets in a last laugh. The Fuzzies have been determined sapient, helped by the fact that not only do they communicate with each other, but the military discovered they have a developed language, albeit spoken in a pitch too high for humans to hear. With the aid of specially created hearing aids, humans can understand and communicate with the Fuzzies. The Zarathurstra company, now charterless, still operates as a mining company, just not one that has any control over the planet. The company’s owner, Victor Grego, has a change of heart, and after finding a Fuzzy in his apartment, becomes completely pro-Fuzzy. Fuzzy reservations are set up, and as they do seem to want to live with humans, an adoption agency is also set up. But as more and more Fuzzies literally come out of the woodwork, for easy living and free food, Holloway and his friends discover something disconcerting – the birthrate among Fuzzies is dangerously low, and few infants survive more than 24 hours after birth. It’s now a race against time to figure out Fuzzy physiology and what’s causing the low birth rates, and more importantly, how to cure it. While Little Fuzzy is nearly pure light heartedness and fun, The Other Human Race is not only more scientifically based, but also more about the politics of Zarathustra. It’s an easy read, but very different from Little Fuzzy. I can see younger readers loving Little Fuzzy, but feeling a little lost in the second book. There is also a third Fuzzy book, Fuzzies and Other People. Stay tuned tomorrow, for a short bio of H. Beam Piper, and some information about his other works. 13 Responses to "The Fuzzy Papers, by H. Beam Piper"
Piper is very under the radar, which is too bad. i’ll be posting a short bio of him tomorrow. This is the same edition I have, the SFBC one. The two books are very enjoyable, and I also recommend them. Do you know if it was only this edition that the 2nd story was published as The Other Human Race, or if they changed it to Fuzzy Sapiens way way later? I should really try to find a nicer copy, ours is falling apart. my other half got it like 20 years ago from a library discard sale. you can still see the library sticker on the spine. 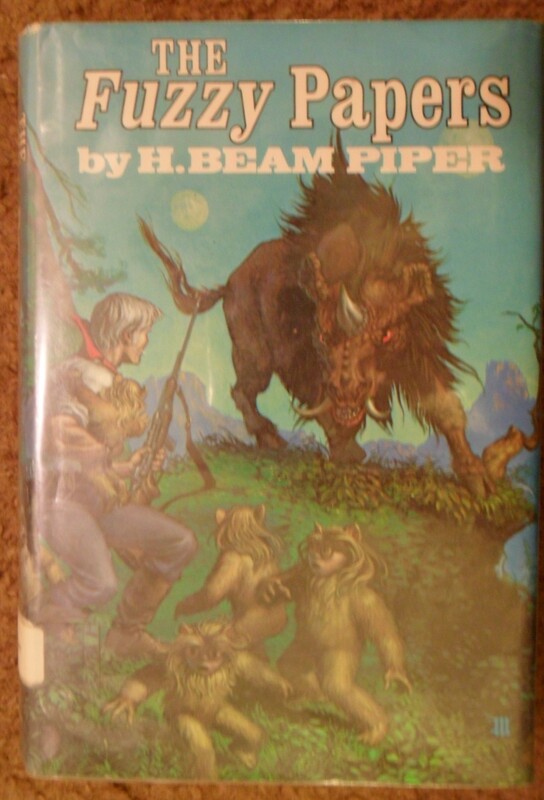 It was later, Piper originally published the book as OTHER HUMAN RACE but it was changed for later publication, after this omnibus edition was published. 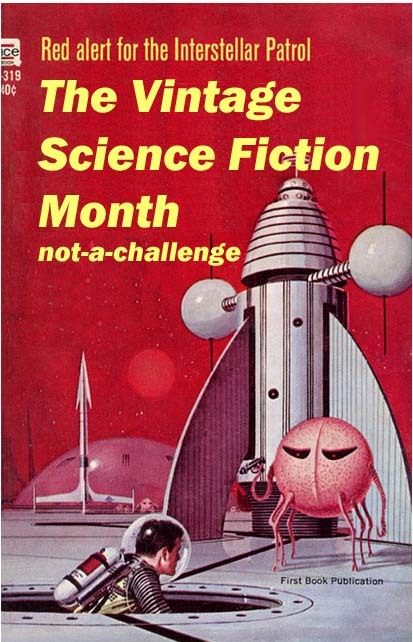 I sure an enjoying this Vintage Sci-Fi “Challege.” I am learn about author in which I have never heard about before than are lost in the scuffle of time. Another good read. I like the cover on this edition. Piper has unfortunately fallen off the fans radar. Hopefully, Scalzi’s book help raise awareness of this author. Haven’t heard of this author, but I love the title…Fuzzy Papers. Love it. Although I haven’t read Piper’s book, from everything I’ve heard Scalzi’s reboot, which I have read (and loved) is a pretty faithful adaptation (leading some to question its necessity). I think it was something that one of the comments mention, his undeserved obscurity, that was a motivating factor for Scalzi. At any rate, both stories do a really good job of examining some of the same things that Asimov’s robot stories, and indeed many other SF stories: the idea of what it means to be human coupled with the ideas surrounding respect for those who are different from ourselves. Like many of Asimov’s robot stories, I think Piper’s story and Scalzi’s reboot do a lovely job of this, telling a touching and engaging story while weaving in a nice message. I’ve seen several posts over the last 6 months or so (since the release of Scalzi’s book) where folks are reading and/or talking about Piper and I think that is great. Little Fuzzy is the kind of book you can share with young adults which is a plus in my mind. I think the ideas of the story remain relevant today and the story is interesting enough to capture the attention of young adults.